The last new commercial building built in Swarthmore’s downtown square was the co-op in 2004. Now 10 years later, Swarthmore College’s plan to build an inn with a restaurant and bookstore, to be called “Town Center West,” is coming close to fruition. But one reason it may have taken so long for the plan to reach approval is that it’s not as simple as just putting up a building. While the borough council approved the Town Center West plan at a February meeting, the plan isn’t getting approval from everyone. 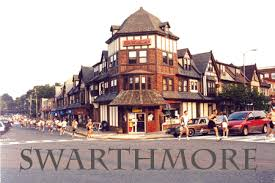 That’s because it not only affects the residents of the borough of about 6,000, but also the thousands who drive along the south side of the Swarthmore College campus, where Town Center West will be located, on Route 320. At least some have concerns about the traffic flow in the proposed roundabout, which will expect 14,000 vehicles per day. Some residents are unfamiliar with how modern roundabouts and mistakenly think they’re like old-school New Jersey traffic circles. But other residents do know how roundabouts work, have studied federal roundabout design guidelines, and point things out about this roundabout’s design that are non-standard and may not be as safe as they should be. The college, its engineers, and PennDOT would prefer to assuage the unfounded fears of the ignorant than address the reasonable concerns of the well-informed. One of the salient problems with the design is how Station Square West will merge into Chester Road below the pedestrian crossing of the northern approach. The SSW merge is where vehicles will exit the train station. PennDOT originally called for station traffic to be routed through Town Center West, so those vehicles would rejoin Chester Road via the roundabout’s western approach, like a standard roundabout. Standard design. But McMahon and Associates, the engineers working on the project for Swarthmore College, convinced PennDOT officials that a merge could function safely. How were PennDOT convinced that this non-standard feature for a roundabout would be safe? What data were marshalled there? Could they point to other roundabouts with a similar merge and show their accident histories and vehicle and pedestrian volumes? Moreover, this SSW merge angle points those merging cars at the vehicles coming from the direction of Rutgers Avenue, and vice versa. At night, let’s say in winter during rush hour, when those motorists in the circulating path round the turn to head north on Chester Road, the headlights of vehicles in the SSW merge lane will be shining directly into their eyes. This angle violates a basic roundabout design principle, potentially subjecting motorists to headlight blindness just as they are negotiating the turn and guiding their vehicles past the concrete pillar at the end of the retaining wall for Station Square East. Another problem is the steep slope of the underpass. I do not know of any roundabout placed just beyond the crest of a steep hill anywhere in the country. If there were one that was working safely, I’m sure its safety record would have been cited by PennDOT in support of this design. Even if the hill is regraded slightly, the question remains whether the retaining walls of the underpass will block the sight-lines that are absolutely required for roundabouts to function safely. Approaching motorists must see not only that there’s a roundabout ahead; they must have a clear view of the traffic already in the circulating path, to which they must yield. They must also see pedestrians on their right, and on the opposite side of the roundabout in the crosswalk there, because they are required to yield to those pedestrians. When I submitted the engineering drawings, 3D renderings, and Google Maps street views of the location to an FHWA-approved roundabout expert with a national reputation, who has worked on 300 roundabouts, Scott Ritchie, he concurred with the concerns described above and described the Intersection Sight Distances as “critical” for the safe operation of this roundabout. At a forum held by Swarthmore College on 18 June 2014, I suggested that the design be submitted to expert peer review. The FHWA/USDOT has an established peer advisory program. Few local jurisdictions have an extensive track record with roundabouts, and peer review is not uncommon. Local PennDOT District 6 has completed only one roundabout, in a bucolic setting near St Davids that has none of the complications of Swarthmore’s busy location. But my impression is that PennDOT is very confident, too confident, in its own sense of what will work safely and efficiently, and is eager to add another roundabout to their slim portfolio. The college likes the design, of course, because it keeps station traffic out of Town Center West. Alternative solutions, such as a series of timed traffic signals, were never properly studied. The current design leaves the queuing problem at Yale Ave and Chester Road unaddressed, the dangerous curve at Harvard Avenue and Chester Road unaddressed, and unaddressed the dangerous jaywalking of college students across Chester Road to the playing fields north of the train station.